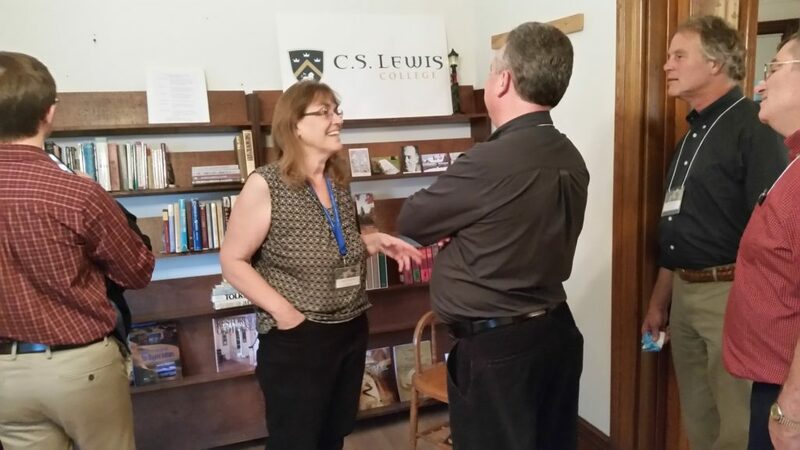 I had a wonderful weekend at the C. S. Lewis Foundation’s summer conference held at the University of Massachusetts in Amherst. Why was it held there? I’ll get to that. As I did last fall, I presented a paper at the Academic Roundtable, a time for deeper thinking as a group of academics listened and discussed what each had to offer. The most interesting part of such a roundtable is getting perspectives from different disciplines. I was the only historian in the group; others were professors of theology, philosophy, and architecture. My paper was on the distinction that we must make between liberty of conscience, which is a Biblically based concept, and pluralism, which is the more humanistic viewpoint—a viewpoint that attempts to push the Biblical worldview out of the public square. It seemed to be well received. Plenary sessions were offered by excellent speakers. 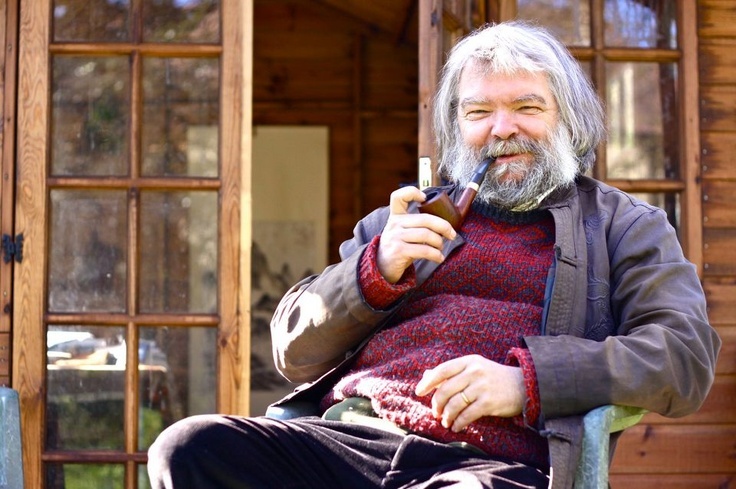 One of the most interesting to me was Malcolm Guite, a minister, theologian, professor, and poet at Cambridge University. He was a captivating speaker, is a songwriter and performer (he gave us some samples), and his poetry is the type that I actually love, which is saying something because I’m not naturally attracted to poetry. With his full beard, long hair, and short stature, he reminds me of a hobbit. That’s a compliment, by the way. 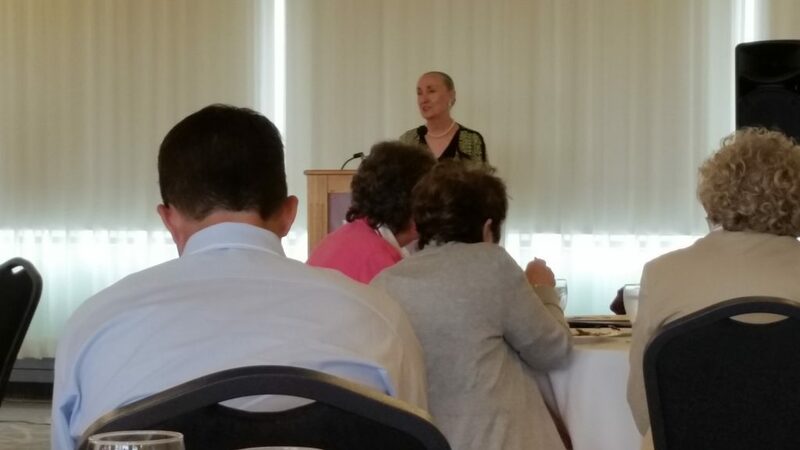 At a special faculty luncheon, Dr. Mary Poplin of the Claremont Graduate School spoke, and her personal testimony was both striking and stirring. She was a strident radical feminist and atheist (toying with Buddhism along the way) before God gave her a dream of standing before Jesus. That, along with other miraculous occurrences, led her to faith at the age of 41. Shortly after, she went to India to work with Mother Teresa. I raised the question earlier as to why this conference was taking place in Massachusetts. The site was only about half an hour from a house that the Foundation has purchased and is planning to use as a study center. 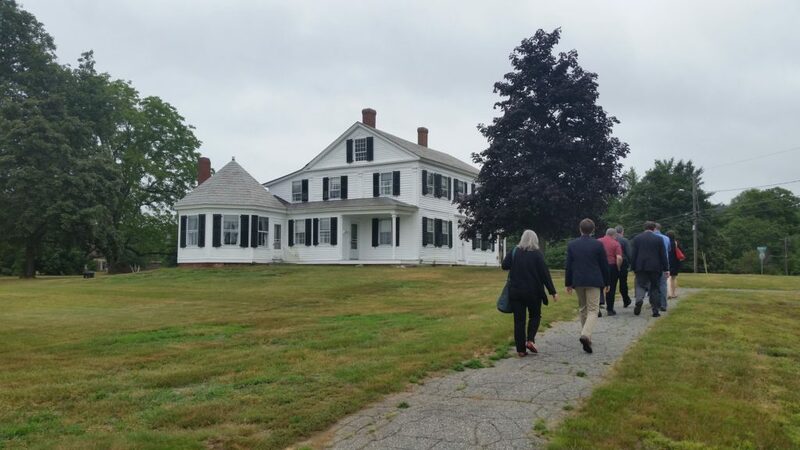 So one of the highlights of the conference was an excursion to that home in the town of Northfield. Currently, a massive renovation of the home is taking place, with the goal of its being a place where students can come and discuss issues of faith and the Christian answer. 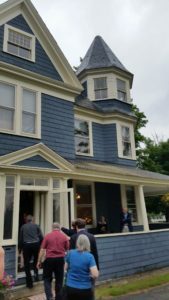 The Foundation already owns Lewis’s home, The Kilns, in Oxford, which it uses as a study center; the goal is to make this a place that can be used in the same way. One of the dreams of the Foundation is to also establish a C. S. Lewis College in the town. It would be focused on the study of the Great Books and intensive discussion/argumentation (that latter word used in the best sense). 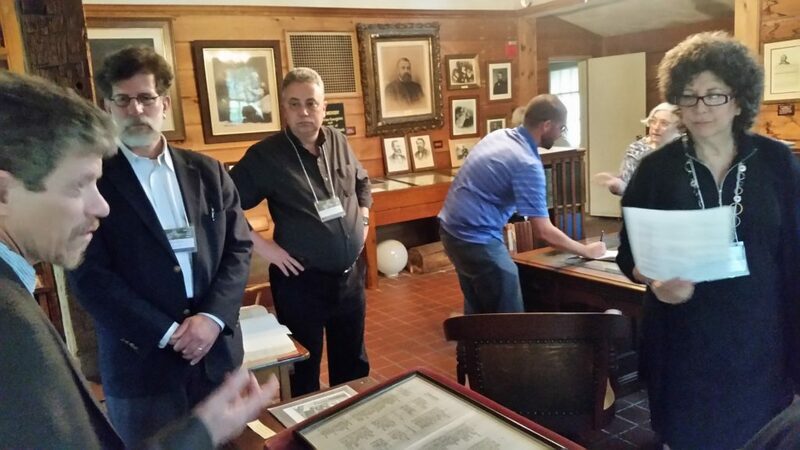 A bonus on this trip was that just down the street is the birthplace of famous 19th-century evangelist Dwight L. Moody, which we also were able to tour. Included in the home was an excellent museum. I took a shuttle to and from the airport. 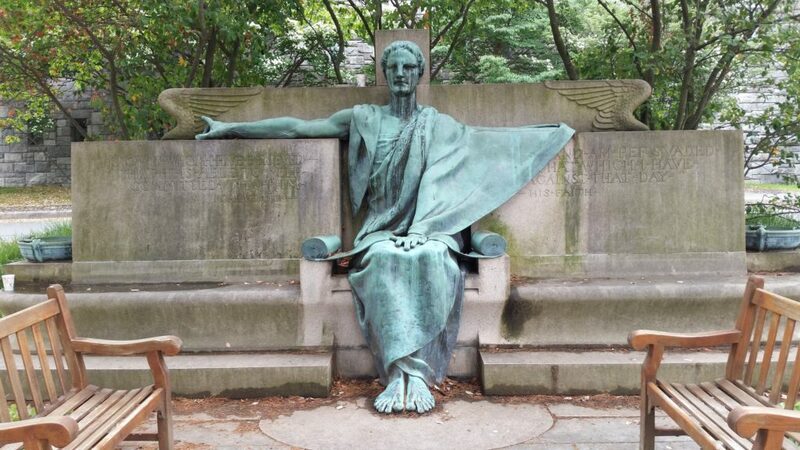 While the shuttle was waiting for another person to pick up at Amherst College, I noticed a statue that I had wanted to see, so I was able to jump out and take a picture of it. Amherst College started in the early 19th century as an institution to train ministers. One of its key founders was Noah Webster, who, as some of you know, was the subject of my doctoral dissertation (and the book that was published as a result of that). The college acknowledges Webster’s role. For I know whom I have believed and I am convinced that He is able to guard what I have entrusted to Him until that day. Amherst College no longer exists for its original purpose, but a testimony remains for those with eyes to see and ears to hear. Many thanks for the hard work and dedication of those who planned and carried out this conference. The Holy Spirit was evident in every aspect of it. A spirit of love and genuine fellowship prevailed.